Going back to this morning- for some reason my brother really wanted to go to the beach. He said he really wanted to build a sand castle. Can anyone here guess what we did? Go to the beach- yes. Build Sand Castles- no. When we got there we got out all of our stuff and got ready to go. We could see that the beach was going to be nice! There was a huge drop where the sand was so we couldn’t see if it were flat sand or had rocks in it. We payed our outrageous parking fee and got all of our stuff out of the car. We were all excited but Aidan was REALLY into it. And then it started to drizzle. And the rain. We looked up and saw that it would be a huge storm, so we packed up all of our stuff and sat in the car to try and wait it out. It was POURING rain! It only took about five minutes to leave, but those minutes were strong. After we spent a few minutes at the beach we had to go back because we would need to pay an additional $30 to stay for another hour. We made it just in time, left, and went to the famous pizza place. We took a walk that I will forever remember through Chicago. It was completely amazing, being on the brink of dawn but having the sun still holding on to the horizon. We entered the pizza place and placed a hold to order. We sat outside for somewhere close to an hour, just relaxing and looking down the alleys as glamorous buildings tried to scrape the sky. We were finally called in by our friendly server to come and eat. The style to the old building was very odd, it was decorated by…. people. Not really people, but their drawings. You were allowed to draw ANYWHERE! We sat down for our pizza and waited as we watched the TVs and talked. It got too noisy after a huge group came so we walked up he once again marker decorated stairs to the upper story of the building. We ordered our pizza and after only 30 minutes or so he came with our order; we got thick crust yesterday so today was the day to try thin. My little brother Aidan wasn’t so happy about that, but he was calm again in a few minutes. We stayed there and once we were done I grabbed a marker and drew on the ceiling. How did I get up there? By standing on the railing and reaching up, of course! Nobody had wrote there because it was too high up, so I was the first one to promote my blog by simply writing CROSSCOUNTRYLIFEBLOG.COM- MY ADVENTURE, and signed it; -LOGAN. After that we took our last looks around on some of the black and white and sometimes blue artwork everywhere before the long ride back. After two days of driving we finally got to our campsite and we were ready to go and set up camp. As soon as we were there however, we just started backing the truck in when the back made a loud noise. The bike rack there had just given up and it fell to the ground. The great news was that none of the bikes were damaged because they had been raised above the ground even though their carrier was injured. The really BAD news was that since our $200 bike rack was broken, and unless we bought another one we would have to discard our bikes. Uh-Oh. Looks like we weren’t going to the big city until later that day (we weren’t in a campground IN the city, but an hours worth away from it)! We called different places to compare prices and find the short percentage of bike-racks that were the size we needed. I slept in back for a while until we had to run a few short (not really) errands. On the drive we found a seller that would give us a bike rack that we needed for only $70. We drove an hour and a half to get to him and when we did we parked near him in the parking lot. We didn’t have the right amount of money that we needed to pay him (we only had some small bills, the others were in hundreds). Anyway, the next day was definitely better than the first. Other than the simply outrageous travel fees and the moderately high parking prices (no offense anyone from Chicago, your city rocks. Where were from, however, the parking is day was a COMPLETE success. The drive to Chicago wasn’t that great until we actually got into he city itself. The buildings were huge! I know I keep saying this, but this is the place that I would want to spend more time in above everywhere else. We were all somewhat hungry but we decided to go to the Animal museum of Chicago first. It looked like one of those university campuses because it was so huge. Each of the building-sized rooms were put into catatories of general species. It really was pretty spectacular. The water tanks were the best part though! They must have had close to 500 tons of water that housed the sharks, dolphins, seals, and all of the other huge beasts that they held there. The next place we went was to the shoreline. We had booked an architectural river cruise that our cousins had recommended to us. We looked down the boardwalk for a long while until we asked for directions and turned around to go in the actual direction of the tour. Once we boarded the boat we were in for a ride. 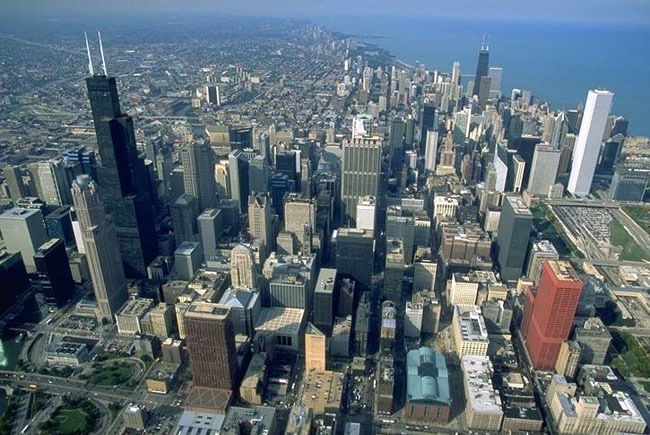 Not just being an architectural tour, it was also a reach into the past of Chicago. The guide was great! All of the buildings had SUCH history in them! It was amazing to see what Chicago had to offer; from the RIVERS perspective. On the way we actually saw the Chicago Cubs! They were at a party inside a shoreside restaurant and the trophy sat in the middle at a table. On the way back the tour guide mentioned it and gave us credit for our spectacular find. So that’s what we did. We turned left that day and had the best pizza of our lives (I didn’t LOVE the pizza, not being a criticized, but I think there was too much cheese. Everyone else, however, loved it). After that we went home (well, Camper home) and watched two shows again to perfectly end the night. I LOVE CHICAGO! Wisconsin Dells is an AMAZING place. I would actually love to live there, and by the time the journey there was over, I was not ready to move on to the next destination! 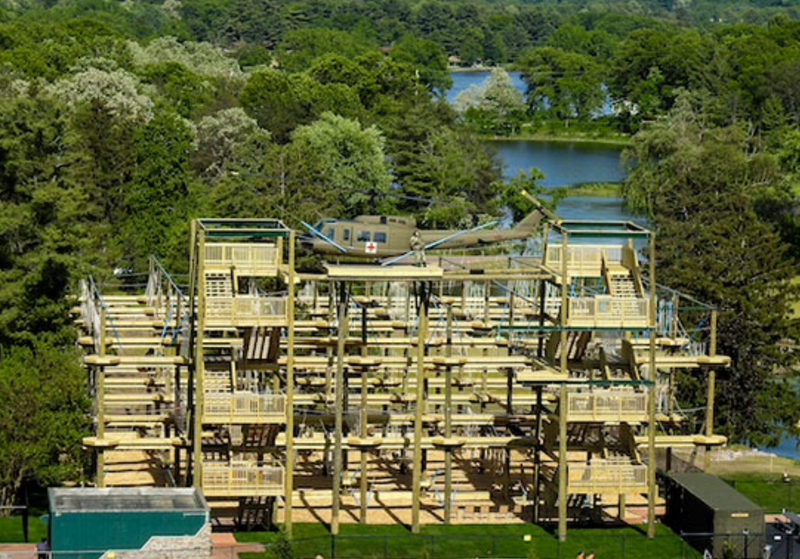 After the time that I “trained” at the D-Day Parkour area (which was also in Wisconsin dells) we took a trip to the worlds biggest water park. It was amazing there and we stayed for quite a long while. After the lazy morning the daily adventure really started when we entered the park. The first thing we did was rent out a locker and put our stuff inside. After that we were free to explore. Our goal was to try and hit every ride (and attraction) in the park. We started that at the wave pool. When I was in Florida with our cousins there were 2 water parks near Disney world that were INSANE. The wave pools were especially large. I remember not being able to walk normally for 2 hours for how much the wave pools shook me up! I do have to say that the wave pool here was spectacular but not quite as impressive as either of the ones in Florida. After the wave pool, which lasted about 20 minutes, we went to the large rides. Some of them were a hundred feet up in the air and went strait down. Some of the rides were body slides; some of them were one- person raft rides, and some were 6-person tube rides. After we were done with all the rides we headed home and watched some of our favorite shows again. We were able to stay awake for two, but we could always watch more tomorrow. That was the end of that our time in Wisconsin dells because the next morning we packed up and left after getting some Curds from Culver’s. This has been my favorite destination so far. The main attraction of the day (and the only attraction of the day was a parkour area that wasn’t quite known for the area (E.g. Potatos in Idaho, pineapples in Hawaii, that kind of stuff). The morning was another kind of chill-at-home kind of morning which was fine by me, giving me more time once again to read, blog, and relax. It wasn’t until 2:00 when we wanted to do something outside the house. After a little bit of research we decided to either do a zip-lining experience or a parkour area. They both sounded fun. The videos for the Parkour area didn’t look very great but we decided to try it anyway. We all wanted to zip line but we did more research and found that there were better places for the same price to zip line on the East Coast. When we got to the place we saw a couple of military vehicles parked outside with a helicopter parked on the top of the structure. We got our gear on and climbed the steps to start onto the Parkour. I started with the second level. You either needed to crawl, jump, fall, or climb. Sometimes the obstacles hurt. When I got done with the entire second floor I went to the first to complete that one. Some of the, had moving parts. One of them had loose parts that I tried to spring across and I fell. My safety net caught me but not before I hit my head on one of the wooden boards and collapsed. When I got back up I went right in to the next one though. I finished the first level but was hesitant when I went to the third level that was around 60 feet in the air. Some of the ones I could easily do on the other levels seemed harder even though they were almost the same.it had been 3 hours before I completed all of the 84 trials there. I climbed down the course and dropped onto the ground at the end. I started to take off my gear when they told me that I could actially go inside the helicopter at the top. I got all of my gear BACK on and trudged back up the levels of stairs. It was pretty scary at the top because I seemed to be at the same level as some of the roller coasters at the Mount Olympus park! I had to walk across a thin board that was around 90 feet in the air with the wind blowing harshly. Yikes! When I got inside I looked around and then sat down. The doors were open, but they seemed to only be about a foot long. Parts of the helicopter were always exposed to the air where the men manning the vehicle must have used to shoot the M-60 mounted there. They must have also used that hatch to jump from 10 feet in the air to the ground with 50 LBS of gear on them in order to land in the field which bullets littered on the ground. It didn’t look like the helichopter was functional anymore (of course it wasn’t, but I was confused as of how they got this 10-ton beast up 90-100 feet into the air onto a small platform where it was being held). I tried to come back but it was a one-way enterence. I had to go around the other side of the helicopter to use another board to get back. After the while experience was over I got a medal for completing the entire course. I was surprised to see that it was actually made of metal and it didn’t look cheap like other parks would give. It made me happy to see that they weren’t dollar store metals and they didn’t just give them to everyone for participation! After the day was over we drove back home and collected sticks in the forest nearby to have a nice fire. We brought the TV outside and watched a couple of our favorite shows to end the night. Before I began I must give a slight update on my travels. As I said in one of my previous posts (here on the second bulletpoint) I would not blog on travel days. That is the exact reason that I have not blogged for half of a WEEK. For 2 of those days before now I was in the car for 7 hours each day so I decided not to popentially get car-sick until I was urged enough to blog today. With that said, let me now begin my slightly late retelling; It’s been a few days know and my memory is now slightly more fuzzy in the smaller details, but I’ll do my best to recall. The morning was another slow one as before, so the first thing that we really did was go shooting with my new airsoft gun. Even though it was only my second time shooting the new gun I hit all of the targets and started to get better. I screwed as I am new to the sport by accidentally almost jamming my gun to the point of no return, but it was all alright in the end. The morning of the next day was not particularly interesting. The main attraction of the day was a place that none of us knew about called “crazy horse”. The locals said it was insane. Of course we had to check it out! When we got there we saw a really odd statue that didn’t look finished. When we walked inside the main building we immediately learned about it and we were impressed. Apparently it would be 6,000 feet high and more than 10,000 feet long. The man that started the project wanted to be a sculptor (some of his amazing work was displayed there, the most impressive being a full horse out of wood carved in only 9 days) and worked for the Indians to show “the white men that the red skins have big heroes too”. He started and worked alone for 20 or more years on the project until he was married and then had 10 children that also helped him. Over a year they accomplished what he did in about 20 and 7 of them still worked on the project far after he died. The project is barely beginning and with modern day equiptment will possibly finished between the next century. If the man had worked himself on it (assuming he lived fully functionally without aging) more than 15 times that. We attended a movie produced busy the owners and it was around an hour long. The place was so amazing that we stayed there for around 5 hours just looking around! I would definitely recommend this place as the top of South Dakota (definitely excluding Mount Rushmore, however). The owners said that the head alone of the statue was as big as Mount Rushmore… not so shore I heard that right. The reason for some of my doubt is that sometimes the nation wants to be more superior than the states. I do not mean that in a bad way at ALL, I just mean that you can’t (shouldn’t) top the country, just as a foot soldier shoul certainly not be in higher command than the general. Sort of how the capital’s dome in Sacramento California is not legally allowed to be bigger than the capitals. Sorry about that. Anyway, as I was saying. At that time we decided to go check out the town and walk around. There was a huge party there which we were once again at the perfect time to be. We walked in at the perfect time! It was starting to get dark so the party in the street was starting to get more exciting. We went out to a restaurant built for Firemen (my dads choice as a retired capitan of Las Vegas) where we stayed while the sun went down. I do have to say, however, that the place was a much better museum than a restaurant. The food was TERRIBLE! I could not eat it so I said that I was full (which is not normally my excuse in this situation) but my dad snuck out a tater-tot from my basket and I didn’t stop him as he gagged part of it down. My brother loved his burger which was obviously what they were known for, but that was it before we threw out overpriced food in the garbage and left. At this time the party was getting lit. What is wrong with me, I don’t ever use that word. Anyway, while the party was getting more EXCITING, my brother went to do a ride while we listened to the concert. He was only there for 5 minutes after the 30 minute wait and the $7 entry fee, but he said he enjoyed it. It was a great night, don’t get me wrong at ALL. By the time we left and went home it must have once again been an hour off of midnight; I prefer to be home and asleep by 10:00 because that’s enough time for me before I’m not really “awake” anymore. The next two days were traced days so I don’t have anything to say about that, therefore I won’t. Have a good rest of your week everybody!